There is nothing like an afternoon nap. And by afternoon nap, I mean lying face down on the carpet while two wound up crazies jump around me. If I can manage to shut my eyes for a ten whole minutes, I consider that a win. However, I do consider this as a form of gambling. Being able to feel slightly recharged to face the evening witching-hour-before-dinner-shenanigans is a high pay out for getting ten minutes of shut-eye. But a high pay out doesn’t come without high risk. Sometimes, I don’t get the short nap. Me lying on the floor can be an invitation for them, yes “them,” to come and aggressively jump on me and pretend I’m an airplane, a boat, or a dead donkey. “GET UP DONKEY!” Ellie will shout. Other times I actually do fall asleep, I never know what I’ll wake up to. It’s amazing what can happen in ten minutes. Chloe once colored her arms and legs with a marker. Another time she drew pictures on the wall. Other times someone might not have pants on (I usually do). One time, every book they owned was scattered around the room that I thought I woke up in a Barnes & Noble stock room. On the other hand, there are times I wake up and it’s eerily quiet. Chloe might be peacefully reading books on one side of the room while Ellie’s doing the same on the other. It’s remarkable, but almost too remarkable that has me feeling uneasy for the rest of the afternoon. 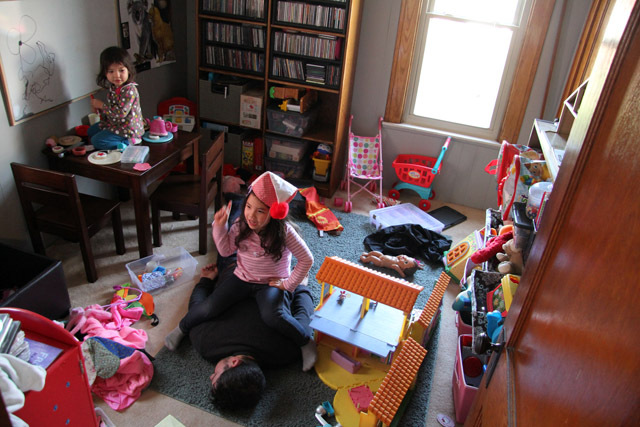 I decided to join them in the playroom to work on puzzles, but as soon as I sat down I knew sitting wouldn’t cut it. My legs felt like I just ran a marathon, my neck and back were stiff, and my eyes felt like Rocky’s after a fight. “Cut me, I can’t see!” I knew I needed to lie down. Just for ten minutes, that’s all. The girls didn’t protest much and kept playing around me. Chloe was sitting at their kid table drawing on the white board. I remember taking a mental note feeling like that could be problematic, but I made no effort to adjust it. Sleep was closing in. I knew this wasn’t anything to be alarmed about. This toilet clogs easily, and well, I may or may not have been in there before Ellie (that’s really not important to this story though). Anyway, I wasn’t worried and grumbled to her to leave it and that I’d fix it later. Her response to this was to flush it again, not once, not twice, but FOUR times in rapid succession. But before I could protest to her over flushing, I heard the sound of water splashing against the cold tile floor. I’m not going to lie. It was bad. With shag carpet still imprinted on my face, I grabbed the plunger and started working the obstruction while used toilet water kept spilling over the edge like the angry sea during a storm. After I opened the airways of the throne, I heard the secondary watery sound. It was like a river flowing in the distance. The toilet was free and clear, but all of the water that pooled up on the bathroom floor was draining through to the basement. Right into the room where I was storing parts of my freshly painted piano. I just wanted to shut my eyes for ten lousy minutes, I thought. My friend is always crabbing on my ten minute naps. “Only ten minutes!? That’s such a tease. I need at least 90 minutes,” she’ll say with such authority as if she’s a professional napper with a Master’s Degree.